These delightful pop-up advent calendar mini house lanterns are perfect for sending a tiny Christmas advent calendar to a loved one anywhere. Place over a battery operated light to see the house light up as a new scene is opened each day. Four traditional German houses are illustrated beautifully in delightful detail. Comes with envelopes and a space for a message. Illustrated by Barbara Behr. 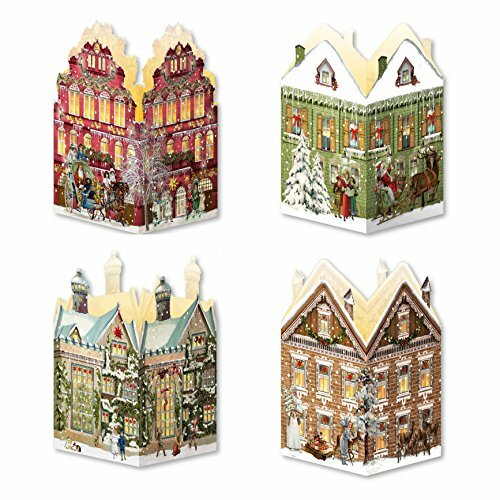 These beautiful pop-up advent calendar cards are designed by the lovely German company Coppenrath, a traditional Christmas goods maker since 1768. Beautiful illustrations and festive designs will delight you and your family the entire advent season. Measures 6.5" x 4.5" x 4.5"
Made of sturdy cardboard and accentuated with glitter. If you have any questions about this product by Coppenrath, contact us by completing and submitting the form below. If you are looking for a specif part number, please include it with your message.